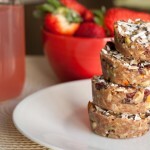 No bake cakes made with fruit and nuts, a perfect vegan and gluten-free snack. Combine almond butter, rice syrup, vanilla, and coconut oil in a small sauce pan. Heat on medium low and simmer for 5 minutes, or until drippy/liquidy stirring every minute or so. Be sure it doesn’t burn! Meanwhile, combine remaining ingredients in a large bowl. Pour heated almond butter mixture into nuts and seeds bowl, and stir until all pieces are coated. 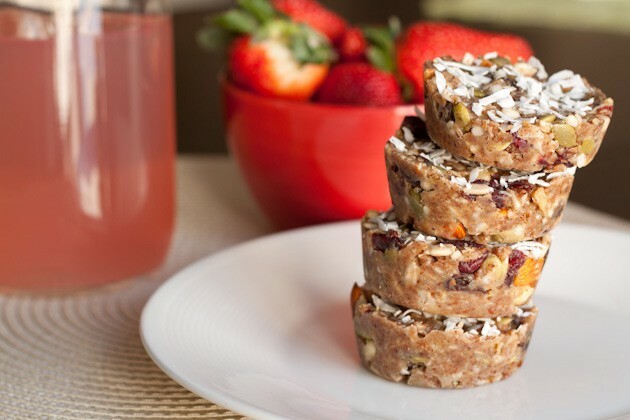 Spoon mixture into large muffin liners or muffin tin [the mixture will be very clumpy and you will doubt that it will all hold together, but don’t worry… it will! ], pressing down firmly on each one and flattening with hands. Sprinkle with coconut and place in the freezer for 30 minutes to firm up. If honey is used, recipe is no longer vegan.